James Comey's testimony about Trump and the Russia investigation shows off his writerly chops. 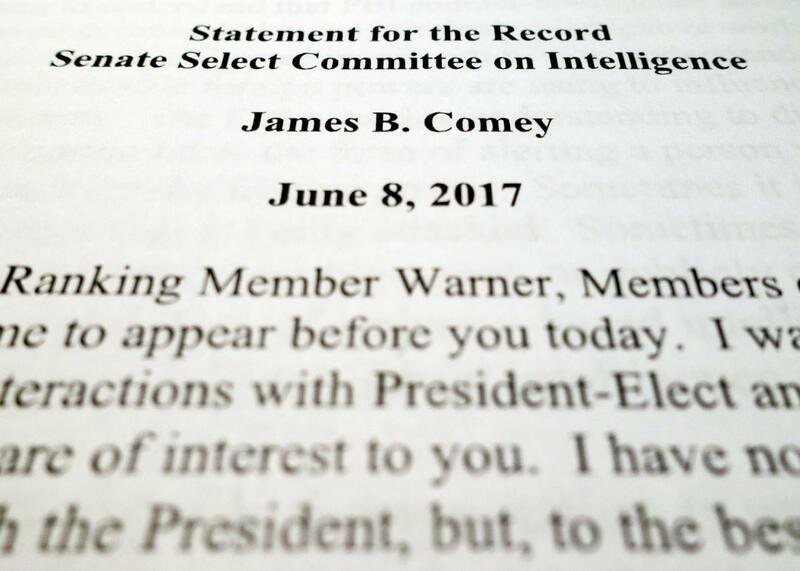 The testimony that James Comey plans to offer the Senate Intelligence Committee on Thursday landed on the internet a day early, and it makes for riveting reading. “The Best Personal Essay I’ve Read in Years,” raved the Awl. The former head of the FBI deploys clear, elegant, forceful prose in his account of several meetings and phone calls with President Trump. It can feel tautly Hemingway-esque, as when he transcribes an aching, elliptical overture from his now-former boss: “Because I have been very loyal to you, very loyal; we had that thing you know.” The document’s kicker—“That was the last time I spoke with President Trump”—would make Shirley Jackson swell with pride (not to mention any number of “the next time I saw Bethany, she was dead” potboiler hacks). Comey’s no-nonsense sentences bear along their vivid details like a sleek agency car smoothly transporting a spy. Readers won’t forget the “door by the grandfather clock” opening and shutting, and the sea of anxious faces behind it flickering in and out of view. Comey knows, too, how to set a scene. Here he is, describing his infamous Feb. 14 meeting with Trump in the Oval Office, when the president asked him to lay off of the disgraced Michael Flynn: “He [Trump] sat behind the desk and a group of us sat in a semi-circle of about six chairs facing him on the other side of the desk… I was directly facing the President.” What staging—just like a movie! But for all the lucid directness of the former spook’s prose—Twitter has already rained tongue-in-cheek praise on his “unnerving economy” and “brisk” pacing—what makes this text truly captivating are the emotional dynamics roiling beneath it. Comey, who says “my instincts told me” a one-on-one dinner with Trump represented “an effort to have me ask for my job and create some sort of patronage relationship,” is the classic man of science and reason confronting forces beyond his ken. Victorian literature is rife with diarists, steeped in Enlightenment thought but not especially prone to play the hero, who painstakingly log the deterioration of truths they took for granted as if their salvation might yet lie in clean syntax and rigorous attention to detail. (Think Dracula’s Jonathan Harker or Dr. John Seward.) In his account, Comey is an upstanding man who feels professionally and morally obligated to chronicle the unraveling of governmental pieties he’s spent his life protecting. He doesn’t want to surrender to melodrama; that’s not his nature. But bland statements of confusion or resistance—“Although I didn’t understand why the President was bringing this up, I repeated that Mr. McCabe was an honorable person”—register the strain of keeping it together. What Comey doesn’t say, in his formal, almost photographical account, matters as much as what he does. The most we learn about our protagonist’s emotions is that he “felt compelled” to nail down his conversations with the president-elect in a memo following their first face-to-face. “To ensure accuracy,” he continues, “I began to type it on a laptop in an FBI vehicle outside Trump Tower the moment I walked out of the meeting.” Comey doesn’t mention a sense of dread, unease, or consternation; he doesn’t have to. His urgent actions speak for themselves. The contrast between inner turmoil and outward composure—both in Comey’s demeanor, while chatting with Trump, and in the consummate professionalism of his prose—makes this testimony more than a fascinating reflection of political intrigue. It amounts to a reluctant psychological portrait, and a text of surprising literary interest, as well. No wonder it has become grist for the internet’s puckish creative writing mill. If your prose is being mocked this hard, you’re doing something right.